As the launch of the new Samsung Galaxy S10 is just around the corner, we all have our hopes high and fingers crossed. As this year is the 10th anniversary of Samsung’s Galaxy S series, what new features will they bring with their flagship? Will it have a jaw-dropping design or an extraordinary camera? We have gathered all the information based on the excessive amount of leaks of the upcoming Galaxy S10 models. This year Samsung will launch three separate Galaxy S10 models having the code names Beyond 0, Beyond 1 and Beyond 2. These models are expected to be named S10E, S10, and S10 plus respectively. S10E is the less expensive one like what Apple endeavored to do with iPhone XR recently and failed, to be precise. A traditional Samsung glass sandwich design is expected. The real design change is going to happen at the front. Like every other smartphone manufacturer, Samsung is also going for the gorgeous Infinity-O display which is Samsung's take on a punch-hole display, with screen sizes being 5.8-inch for Galaxy S10E, 6.1-inch for Galaxy S10 and 6.4-inch for Galaxy S10+. The S10E will feature a flat screen with a single hole punch camera on the top right corner. On the other hand, S10 and S10+ models are expected to have a curved edge screen with almost no side bezel and a minimalistic chin at the bottom. S10+ will have a dual camera at the front at that means a bigger hole in the display and some people might not like that. But it all comes down to personal preference. Galaxy S10 and S10+ will most likely bring in the long-awaited Ultra Sonic in-display fingerprint reader, which will be the alternative to the Iris Scanners found on the Samsung Galaxy S9 and S8 models. The camera is a standout amongst the most essential elements of a cell phone. As per the leaks, Galaxy S10+ will equip a triple camera setup at the rear as it is a pattern these days. The three cameras are a 12MP ordinary camera with f1.5/f2.4 variable Aperture, a 16 MP f/1.9 ultra-wide lens with a 123-degree view, a 13 MP f2.4 telephoto. Galaxy S10 will have a similar setup however the less expensive model S10E will have a dual camera at the back (ultra-wide lens is absent). The front camera is the same on all three models but the S10+ will have an additional 3D Time of Flight Sensor for 3D Facial Scanning. The main focus is on the new Snapdragon 855 processor that is based on the 7nm chip. This processor is equipped with 4th generation AI technology, 5G support, and 4K HDR video playback support. This processor will only be available in the US market. The processor for international models is Exynos 9820 clocked at 1.95GHz (base frequency). This processor is equipped with a neural processing unit (NPU) for artificial intelligence purposes. The specialty of this processor is that it has Image processing qualities. S10E will have 6 GB RAM and 128 GB Internal Memory. S10 will have two models: one with 128GB internal storage and 6GB whereas the other one will have 512GB storage and 8GB of RAM. S10 Plus is rumored to have three models one with 128GB/6GB and second with 512GB/8GB and third with whopping 1TB internal memory and 12 GB RAM. 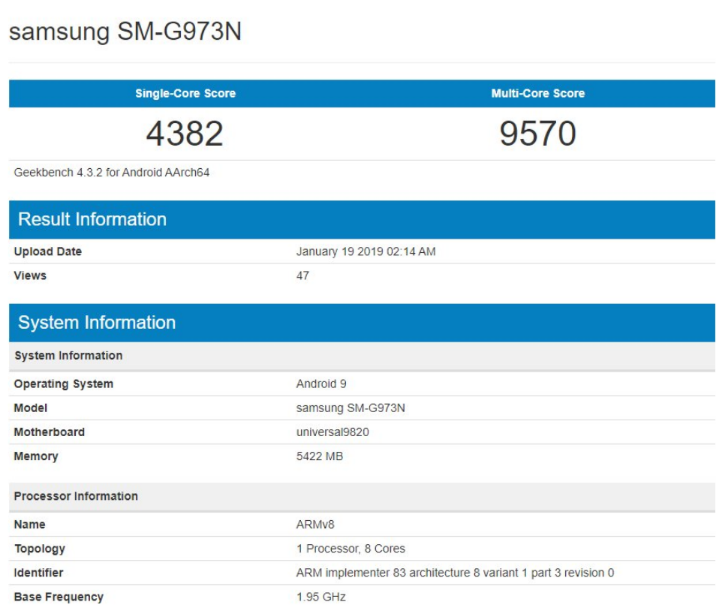 The benchmark score of Exynos model is very close to the Apple A12 Bionic chipset. The Galaxy S10 launch event will be held at San Francisco on 20th of February. All Samsung has to do now is to confirm what has already been told numerous times by leakers, case manufacturers, and tipsters. Ahmad Ejaz is a Software Engineering student from National University of Sciences and Technology, (NUST) H-12, Islamabad.